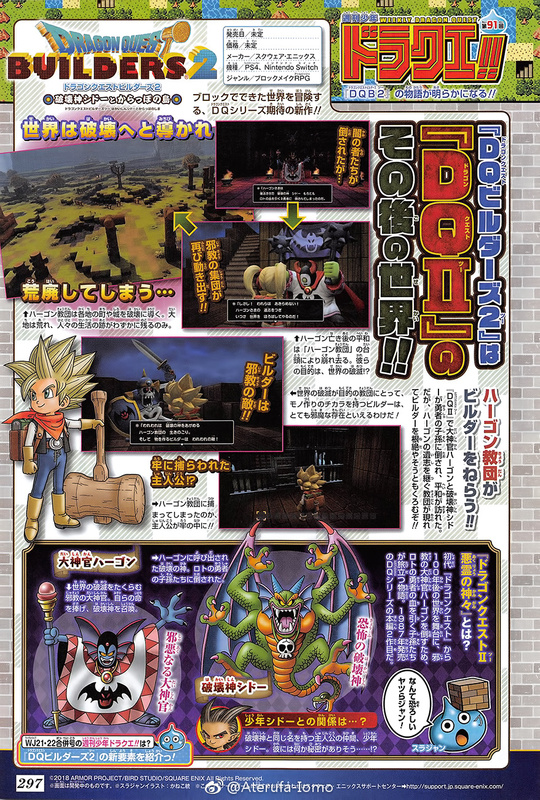 Dragon Quest Builders 2 is set in the world of Dragon Quest II following the events of its story, the latest issue of Weekly Jump reveals. In Dragon Quest II, the corrupt cleric Hargon (who planned to destroy the world by sacrificing his own life to summon the God of Destruction) and the God of Destruction Malroth were defeated by the descendants of the heroes, and peace visited the land, but a religious order that inherited Hargon’s intentions appeared with the intention of eradicating the Builders. The peace that came after Hargon’s death collapsed with the rise of the “Hargon Order,” whose goal is to destroy the world. The Hargon Order spearheads the destruction of towns and castles all over the world. The earth falls into ruin, and there are little remains left of peoples’ lives. But for a religious order whose goal is to destroy the world, a Builder with the power to create things is a major hindrance. The protagonist of Dragon Quest Builders 2, a Builder, was captured by the Hargon Order and thrown into jail. A previous update introduced a boy named Malroth, who has the same name as the God of Destruction Malroth. A blurb in Weekly Jump teases that there seems to be some sort of secret surrounding him. Dragon Quest Builders 2 is in development for PlayStation 4 and Switch. A release date has yet to be announced. If you missed it, read up on the game’s protagonist and setting here, and Malroth here.